Royal Caribbean's Adventure of the Seas has been forced to skip two ports of call after oil loss from its fixipod propulsion unit forced the crew to shutdown the pod. Cruise Critic reports Adventure of the Seas will undergo repairs during her scheduled drydock on March 30 but Royal Caribbean says sailings between now and then will be unaffected. 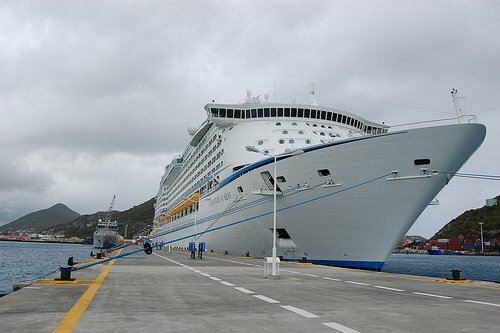 Royal Caribbean confirmed the issue and issued this statement,"Yesterday, as Adventure of the Seas was arriving to St. Kitts, the ship became aware of oil loss from the ship's fixipod," Cynthia Martinez, director of global corporate communications for Royal Caribbean, told Cruise Critic. "Oil booms were immediately placed around the ship to contain the oil. Engineers required additional time in port in order to continue working on the issue." Repair work on the propulsion caused the Royal Caribbean ship to not leave St. Kitts until 3am and unfortunately engineers cannot fully repair the unit, so it will remain offline until Adventure of the Seas goes into dry dock March 30. This will cause the ship to sail at a reduced rate of speed. As a result of the reduced speeds, Adventure of the Seas has cancelled its scheduled port calls to Aruba (March 20) and Curacao (March 21). Instead, Adventure of the Seas will visit Antigua today, St. Maarten on Thursday (staying overnight) and St. Croix on Saturday.